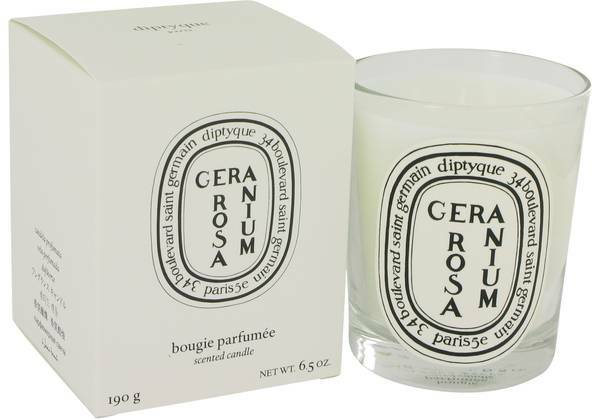 Diptyque Geranium Rosa Perfume by Diptyque, The Diptyque Geranium Rosa scented candle has a refined and elegant aroma that combines soft, rosy floral tones with bright, green leafy notes. This lovely soy-blend wax candle utilizes the leaves of the rose geranium plant to achieve the well-rounded and full-bodied rose fragrance that emanates from it, as the leaves are actually more scented than the flowers. In addition, the aroma of traditional geranium adds a subtle citrus quality, and mint Read More Read More contributes green freshness to the perfumed candle. One whiff of this candle transports you to the sunny gardens of Provence, where the rose geranium flourishes. This candle rests in a clear glass jar with the distinctive label of the Diptyque brand and boasts a 60-hour burn time. The company began in 1961 as a shop for fabrics, furniture and accessories, started by a trio of friends in St. Germain, Paris. It is now known for its high-end home fragrances, décor accessories and perfumes. All products are original, authentic name brands. We do not sell knockoffs or imitations.